It is 11:55 a.m. on a Wednesday in early October, and room 101 of the Joe Rosenfield ’25 Center is already packed. Students, staff, faculty, and community members have all gathered to witness “Making a Career of Changing the World,” a panel discussion led by this year’s winners of the $100,000 Grinnell College Innovator for Social Justice Prize. Seated on a panel facing the audience are prizewinners Luna Ranjit ’00, Jackie Stenson, and Diana Jue Rajasingh, along with Wall Alumni Award* winner Trevor Harris ’89. Smiling, they look on as a handful of stragglers find seats by the windows or stand toward the back. 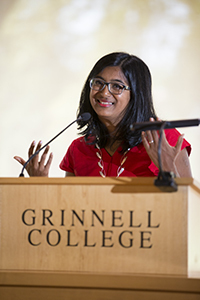 Ranjit, a Nepali native and the first Grinnell College graduate to receive the Grinnell Prize, introduces herself first. Five years after graduating with a degree in economics and global development studies, she founded Adhikaar, a multifaceted organization that promotes human rights and social justice in Nepali-speaking communities in New York City and across the United States. She and others from her organization were instrumental in securing the 2010 passage of the Domestic Workers Bill of Rights, making New York the first state to include domestic workers in all major labor laws. Stenson and Rajasingh, the other 2016 prizewinners, have worked extensively to improve the distribution of social impact technology in rural Indian villages. Their organization, Essmart, connects directly with local street vendors in India to research, source, and distribute essential technologies, addressing a supply-chain breakdown and empowering rural communities to drive their own economic growth. But Ranjit, Stenson, and Rajasingh are not at Grinnell to simply list their achievements and collect their winnings before catching the next flight out of Iowa. Rather, they are here to participate in Grinnell Prize Week, a four-day series of events designed to educate and inspire students so that they may one day pursue their own social justice dreams. Although the Prize is only in its sixth year of existence, social justice has been integral to the College’s mission since 1846. That was the year that a group of New England Congregationalist ministers set out for the prairie frontier, determined to establish a college rooted in their ideals of abolition and social reform. Throughout its history, Grinnell has remained true to its progressive roots. In the 1850s, the College began admitting women. In the 1860s, Josiah Bushnell “J. B.” Grinnell, founder of the town and benefactor of the College that bears his name, worked as an influential “conductor” on the Underground Railroad that secretly transported slaves to freedom. Half a century later, Grinnell graduated six students — four men and two women — who would go on to become key New Deal administrators. But how exactly can an institution educate students to not only do good, but also, in Rajasingh’s words, “do good well”? 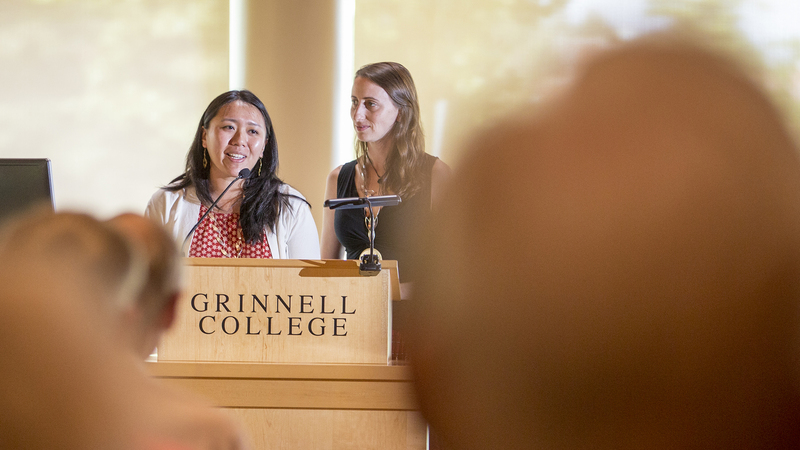 The Grinnell Prize was always intended to inspire the next generation of social innovators, but this year marked an unprecedented effort to frame that goal as a central focus. Although winners have previously been invited to campus to accept their prizes and engage with the Grinnell community, never before have so many events sought to establish the prize within a continuum of social justice leadership. “This is the first time that we made an intentional effort to demonstrate through Prize Week programming how students may utilize our network of Wall Alumni Award and [Grinnell] Prize winners to further their own social innovation interests, both here on campus and after they graduate,” says Susan Leathem Sanning, assistant dean and director of service and social innovation. “This new programming focus — in addition to meeting with students about their potential interests and leading short courses, internships, externships, and workshops — is part of our new effort to integrate the prize and its winners into the educational mission of the College,” she says. Maria Vertkin, who won the 2015 Grinnell Prize for her work training low-income bilingual women to become medical interpreters, participated in many of the events, as did past Wall Award winners Harris and Alvin Irby ’07. At the events, students engaged the prizewinners with big-picture questions such as “What are the struggles of working for a community you aren’t part of?” as well as more targeted questions about fundraising strategy, organizational sustainability, and networking skills. These sessions, which ranged from panel talks to breakout workshops and a “coffee connection” at Saints Rest Coffee House, offered students a variety of opportunities to learn from the prizewinners. As they made the rounds, students filled out a Prize Week “passport,” earning stamps for each event they attended. Students who attended all six public events were entered into a raffle to win an iPad mini. Prize Week is just one of the ways that Grinnell inspires its students to pursue social justice. Last year, the College introduced Spark Tank, a new initiative that challenges students to design their own socially just innovations. Loosely modeled after the eponymous television show Shark Tank, in which innovators compete for project funding, Grinnell’s version adds a twist: Students must create innovations that address challenges generated by members of the town community. Local experts on last year’s topic, education, also joined Grinnell Prize winners on the panel of judges to determine which teams would receive funding. “What we’re trying to do is have a continuum that connects students through volunteering, service learning work-study, Prize Week programming, and initiatives like Spark Tank, so that the Grinnell Prize isn’t a stand-alone, ‘look at this amazing project that somebody’s doing,’” says Sanning. Ultimately, Prize Week is not just a celebration of the winners and their pioneering work; it is also a celebration of the College’s ongoing commitment to pursuing social justice. While the work is never done, Prize Week serves as a reminder that Grinnellians continue to cherish and uphold the values upon which the College was founded. * The Joseph F. Wall ’41 Sesquicentennial Service Award is a $25,000 prize given each year to two Grinnell alumni to either start or complete a project that shows creativity and commitment to effecting positive social change.